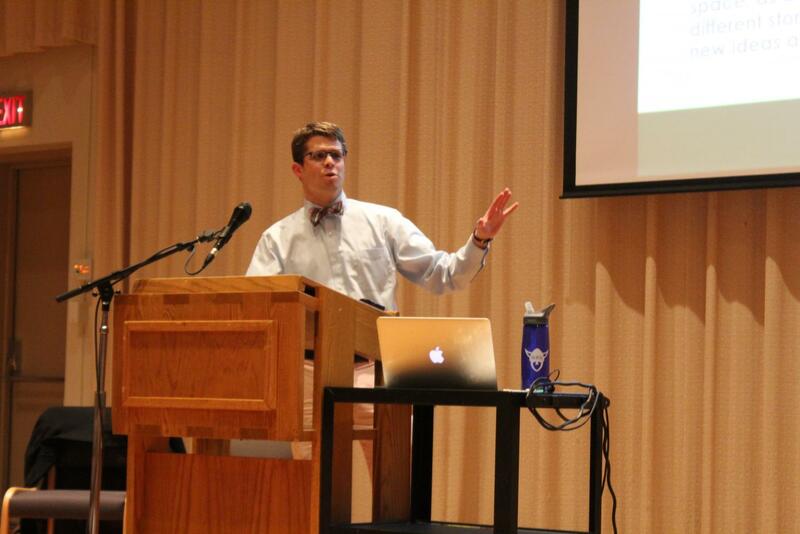 Visiting Assistant Professor of Religion James Hoke spoke on queerness and how it relates to "The Odyssey" and Paul's letters to the Romans on Nov. 6. Visiting Assistant Professor of Religion James Hoke delivered his lecture “Heroic Journeys and Queer Hospitality: Odysseys around Paul’s Letters” in the Paideia Texts and Issues Lecture Series on Nov. 6 at 7:00 p.m. in the Center for Faith and Life Recital Hall. “[The theme] was chosen with ‘The Odyssey’ … in mind and the relevance of the concept of hospitality in our current global context,” Associate Professor in Library and Information Studies Rebecca Sullivan (‘84) said. The focus on contemporary issues in this series resonated with Hoke, and he used a modern understanding of the word “queer” to reexamine ancient texts and find diverse interpretations within them. Hoke is currently researching Paul’s letters to the Romans in order to write his own book on biblical queer theory and how it relates to Paul’s philosophies. Hoke sees many connections between his work and “The Odyssey,” most notably the parallels in the journeys of Odysseus and Paul. Both detail encounters with queer people in the Mediterranean, and how both men were reliant on their hospitality while travelling. During his lecture, Hoke defined “queer” as traditionally referring to LGBTQIA+ people but expanded this definition to include anyone resisting, transgressing, or otherwise going against the accepted norms of society. Hoke believes the character Calypso in “The Odyssey” perfectly encapsulates this concept. Within the story, Calypso identifies a double standard in the predominantly patriarchal Pantheon and consciously subverts the expectations placed upon her gender by taking a lover and treating him as an equal, which goes against the notions of Ancient Greece and its emphasis on a masculine authority within a relationship. Here, Hoke referred to Calypso’s queerness, which is perceived by the protagonist, Odysseus, as inhospitality since she initially refuses to grant his requests to leave the island. Hoke went on to talk about the representation of queerness in Paul’s letters. Following Jesus’s crucifixion, Hoke argued that Jesus’s teachings were spread by various groups from extremely diverse backgrounds with the core message of egalitarianism. This was a radical idea for the time and managed to gain a strong following from many minority groups, including enslaved men, women, and foreigners. These queer people are often omitted from history and the Bible, and Hoke urged his audience to recognize and engage with their stories and the different perspectives they represent. Professor of Religion Robert Shedinger was intrigued at Hoke’s ability to show diversity in these ancient texts. The next presentation in the Paideia Texts and Issues Lecture Series will be held on March 5 and is titled “Finding the Hjemland: Herbjøtm Gausta and the Immigrant American Artist Experience.” It will be presented by Associate Professor of Art History Kate Elliott.